On entering Linden Square a heightened air of exclusivity is received. 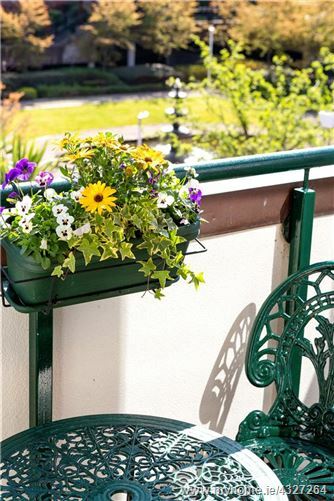 The communal grounds are meticulously kept throughout and are abundant with various planting, box hedging & mature shrubbery. 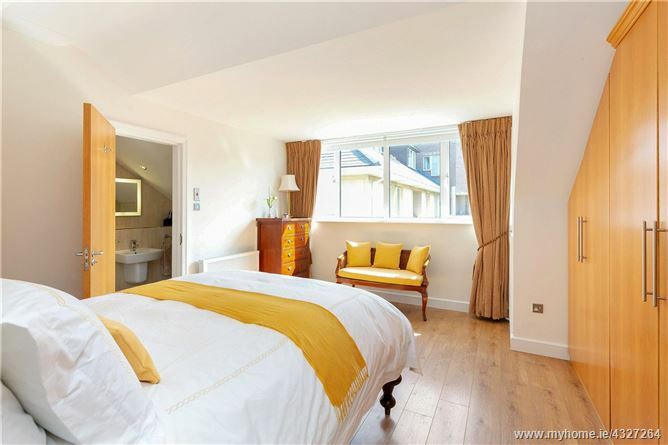 House 2 contains just 5 apartments with Apt.5 covering the whole of the third and top floor. Apt. 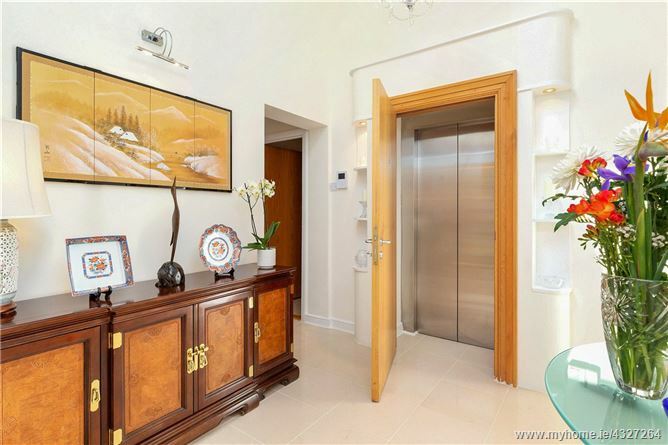 5, an ex-show apartment reveals a range of special selling features including secure elevator access right up to its very own front door. 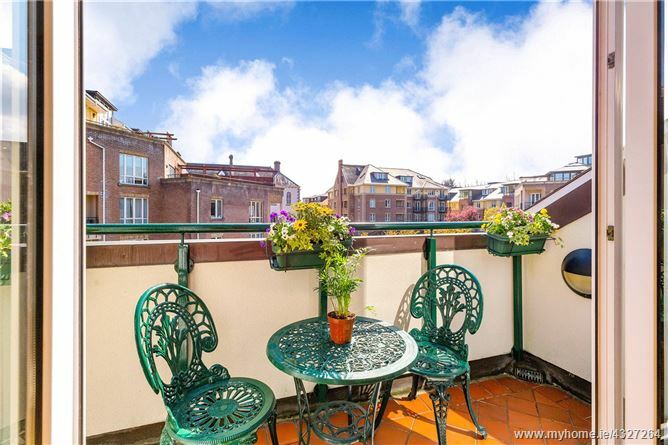 From the outset it is evident that this wonderful penthouse apartment has been lovingly maintained by its current owners leaving little to do beyond moving in. 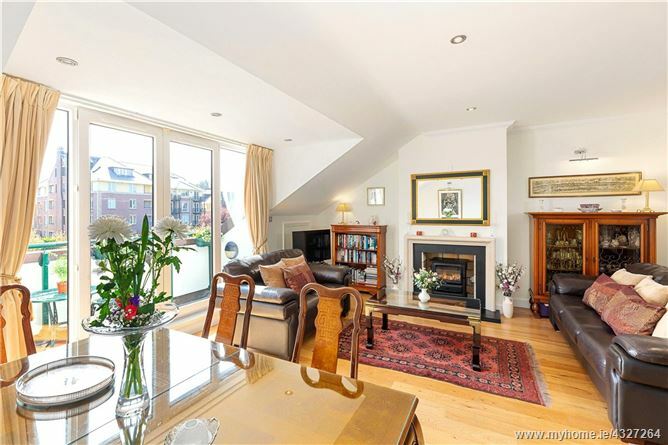 After embarking to this top floor penthouse, one steps out into full height entrance hall which radiates with natural light & splits into two directions giving a great sense of space. The accommodation, in brief comprises of a most welcoming living room which serves as a spacious recreational expanse for one to unwind and features an attractive open stone fireplace with a flame effect stove inset. The kitchen (which also contains its own utility and separate store rooms, as well as access to the expansive eaves area) has been upgraded to a very high specification and features fitted Miele appliances. An upgraded guest toilet completes this area of the property. 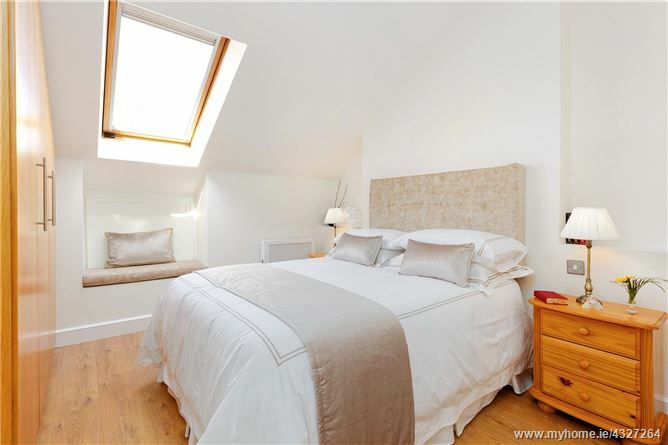 Away from the living areas, at the other end of the property, are three double bedrooms with the master bedroom enjoying an ensuite and a separate family bathroom which have both also been upgraded to a high standard by the current owners. 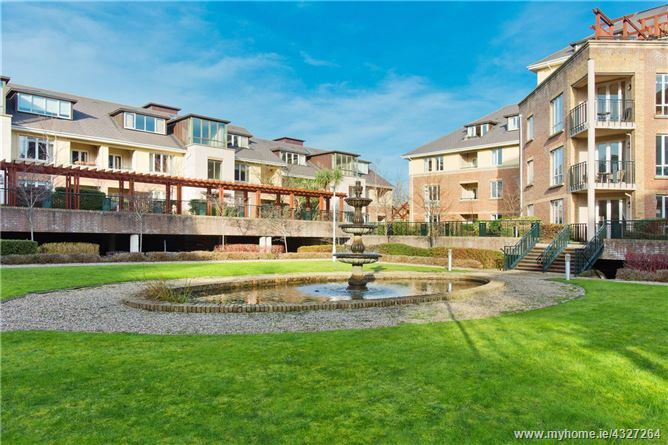 The location is superb and is within walking distance of both Blackrock and Stillorgan villages, offering numerous amenities including shopping centres, cafés, restaurants, bars, local and boutique shops. The area also provides first class educational facilities at primary, secondary level as well as the UCD/Smurfit Business College. 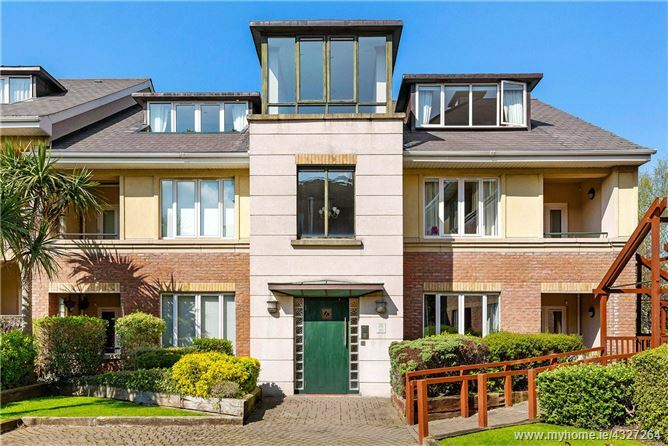 The development is situated off Grove Avenue, a quiet residential locality in Blackrock which is a short walk from both the DART, the N11 & the QBC with Dublin Bus routes to and from the city centre and UCD. Entrance Hall Limestone tiled flooring, feature part glass paneled wall, Velux window, alarm panel, down lighters, access to attic, door leading to stairwell. 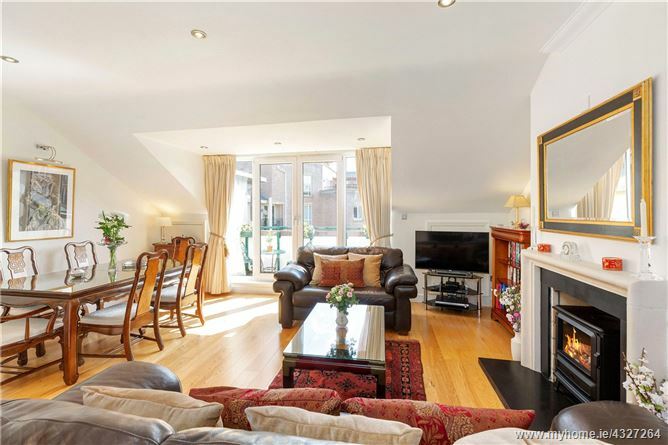 Living Room 5.94m x 5.16m. Wooden flooring, recessed spot lighting, Smart electric radiator, underfloor and Ceiling heating options installed, Dimplex flame effect stove inset in open stone fireplace, eaves storage, UPC point, double doors lead out to balcony. Kitchen 4.14m x 3.32m. Tiled floor, polished granite counter top, double basin stainless sink with tiled splash back, recessed lighting, two electric powered Velux windows. The kitchen is fitted out with a range of Miele equipment including dishwasher, induction hob, and fully integrated oven, fridge/freezer and microwave. Off the kitchen is an additional storage room with polished granite counter top and large cupboard. It also provides access to the extensive eaves storage area. Utility Room Tiled floor & part tiled walls, counter top & storage cupboard, light, Vortice fan, Miele washing machine, Miele dryer. Bedroom 1 4.14m x 4.73m. Laminate flooring, Recessed LED and spot lighting, smart radiator, built-in wardrobes, UPC point, alcove storage left & right of window. 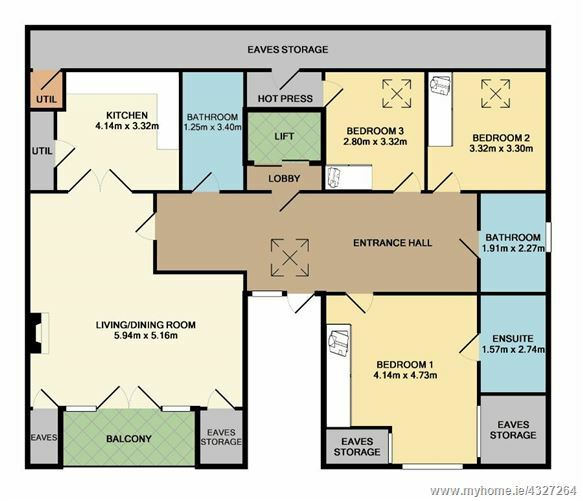 Ensuite 1.57m x 2.74m. Fully tiled floor to ceiling height, wash hand basin, WC Vortice fan, Mira power shower, with sliding glazed door integrated shower head, vanity mirror, & shaving mirror, alcove recessed glass shelving, heated towel rail, underfloor heating. Bedroom 2 3.32m x 3.30m. Laminate flooring, built-in wardrobes, TV point, LED lighting, Velux windows, hot press with immersion heater and storage shelving. There is also access to full length of apartment eaves storage area. Bedroom 3 2.80m x 3.32m. Laminate flooring, Smart radiator, built-in wardrobes, Velux window. Bathroom 1.91m x 2.27m. 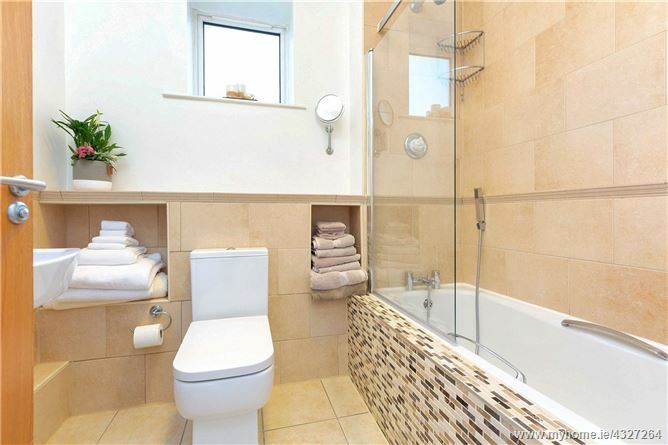 Tiled flooring, mosaic tiled integrated bath with powered mixer taps and integrated showerhead, glazed shower screen, WC, wash hand basin, Vortice fan, vanity mirror & storage unit, tiled alcove shelving. 2 Parking spaces, directly beside access door. Management Fees approx. €2, 100 p.a.